The photos above explain why brides are willing to cross an ocean for a destination wedding in France. 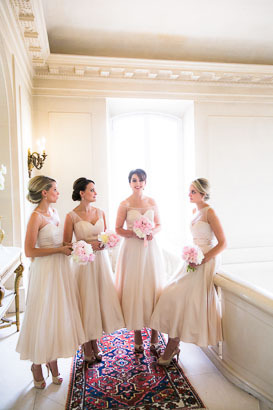 Alison and Philip chose the Chateau d’Artigny for their wedding in the dreamy French countryside. They hired us as their photographers, and the Paris based American event planners of Fete in France to plan their dream wedding. The bride’s Swarovski crystal Louboutin Stilettos drew oohs and ahhs from every girl who cast eyes on them. Those sounds were bested by the reaction the veiled bride received when she entered the ceremony. What pairs better than a veil lit by enormous chateau windows? How about the trio of veil, grand windows, and the majestic marble staircase of this gorgeous French chateau? Now that’s an entrance. The virtual fireworks that scene caused were followed by real fireworks on the chateau grounds later that evening. The beautiful photo opportunities the day provide illuminates why photographers in France dream of destination weddings at charming countryside chateaus just as much as brides do.